A person who is obese has far more weight than what is considered healthy for their body type. Obesity is a serious and at times life-threatening condition that can contribute to health problems such as diabetes, stroke, some cancers and heart disease. Maintaining a proper diet and exercising regularly are lifestyle modifications that can help combat obesity; however, not everyone who applies these practices is able to lose weight on their own. If diet or exercise does not yield sufficient results and a patient’s weight continues to pose a risk for developing complications, their doctor may suggest weight loss surgery. 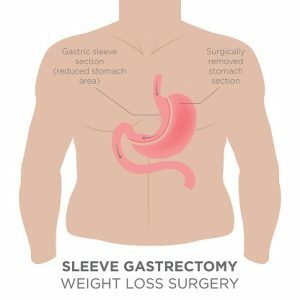 One of the procedures a physician may recommend is a sleeve gastrectomy. This operation is often utilized for patients who are too heavy to safely undergo other types of weight loss surgery. A sleeve gastrectomy requires the surgical removal of part of the stomach. This permanently reduces its size by approximately 25% (about the size of a banana). The surgeon then creates a new tube-shaped stomach or “gastric sleeve.” With a smaller stomach, food intake is restricted and the patient will feel fuller more quickly. This procedure is irreversible and usually performed laparoscopically. Each case is unique to the individual and it is important to keep in mind that all surgical procedures have their risks. Please speak with your doctor about which weight loss surgeries may be best for you. Overcoming obesity can be difficult. You may have tried several weight loss treatments or methods to lose weight, but were unsuccessful. Fortunately, bariatric surgery is an option that often yields results and success stories. Flushing Hospital Medical Center offers a unique and multidisciplinary program that involves a complete mind, body and wellness approach to weight loss surgery. For more information about the Bariatric Surgery Services at Flushing Hospital or procedures performed by our doctors, please call 718-670-8908. This entry was posted in bariatric and tagged bariatric surgery, sleeve gastrectomy, weight loss surgery by Xavia Malcolm. Bookmark the permalink.